If you’ve seen any of my previous posts, you’ll probably know that I’ve been doing a lot of playing around and experimenting with CSS3, including transitions which I’m a huge fan of. This post will be furthering the experimentation and looking into more creative ways in which transitions could be used and hopefully providing some ideas for more practical usage of the property. 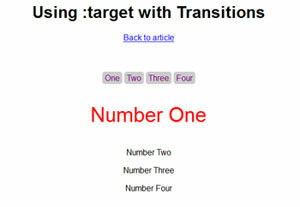 Before we go any further, don’t confuse triggering transitions on click with triggering them when in the :focus state. Yes, if your element has properties defined on :focus, then the transition will trigger when the element is clicked, but only when that element is clicked, and it will also revert to its original state when you release the click. What we’ll be doing is triggering the transition by clicking on a completely different page element causing the transitioned elements new state to remain in that new state for the forseeable, whether you release your mouse button or not. 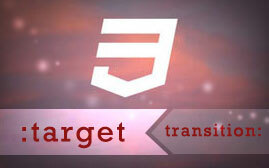 So what’s this :target thing all about? 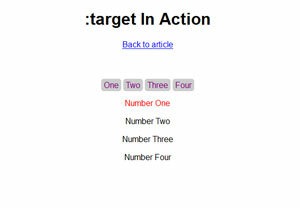 :target is a pseudo-selector, just like :hover and :visited, but it’s not so widely known or used because, well, there’s not much need for it in your average project. You know sometimes when rather than link to another page, you link to an element in the same page? Well that’s where :target comes into play. If you’ve used CSS3 transitions before, then the rest will be fairly obvious – if not, read on to see how we can make :target a little more impressive. How easy was that! If you’re a bit confused by what’s just happened, you might want to read my posts on CSS3 transitions which should explain all you need to know. If you’ve put this technique to use or if you’ve got some creative ideas that your planning to carry out then I’d love to hear about them in the comments section. Stephen Greig is a 25 year old Freelance Web Designer/Front-end guy, currently living in Nottingham, UK. Stephen is also the creator of messivsronaldo.net and author of CSS3 Pushing the Limits, a book on advanced CSS3. You should follow him on Twitter where he talks about the web, sports, music and swears a lot. Stephen's also on Google+ if that's more your bag.